Welcome everyone, I have some great videos for you this week. I want to bring you my FIFA 13 Career Mode with Oldham Athletic. We are going very strong in the sub, but can we carry on our run with Manchester United in our way? Be sure to watch the video below and find out what happens next. 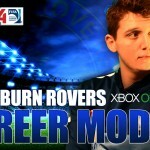 Other than a Manager Career, I am trying my ways as a player with Blackburn Rovers. After the team not wanted me in their side, I show them different and scoring goals and making them assits to help my team through the Premier league. Be sure to subscribe to my channel for Daily content and much more.